Color in the Beryl group. The color of beryl, ideally Be3Al2Si6O18, is usually dominated by its Fe2+ and Fe3+ content. Fe2+ produces pale blue color, Fe3+ produces golden-yellow color, and when both Fe2+ and Fe3+ are present, the color is a darker blue. Green color in iron-containg beryls commonly results from a mixture of blue and yellow. 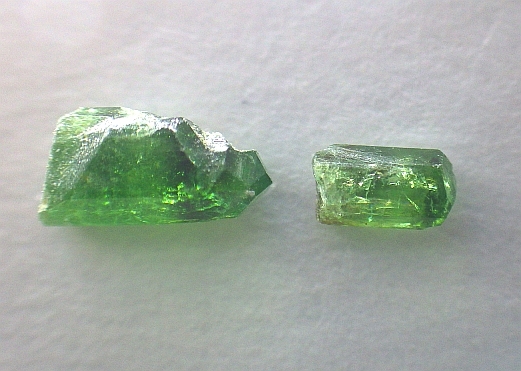 Green color can also come from Cr3+ as is found in the variety emerald. Green color is also caused by V3+. Manganese-containing beryls are pink to red color. The color is pale pink when the manganese is present as Mn2+ and red when Mn3+ is present. Some blue beryls originally found at the Maxixie mine in Brazil have color from radiation-induced color centers. Pezzottaite, CsBe2LiAl2Si6O18, and bazzite, Be3Sc2Si6O18, are both related to beryl and show similar colors. In the spectra of all these minerals, sharp features in the near-infrared region arise from water molecules in the c-axis channels of the beryl structure. GRR 2536a spectrum; Beryl, variety pale blue, Mt. Antero, Colorado, 8.663 mm thick. This does not show the characteristic aquamarine feature near 650 nm. MT vp-33-1 spectrum; Beryl, variety aquamarine (pale blue), Siberia, Russia, plotted as 10 mm thick. Contributed data from M. Taran, Kyiv, Ukraine. MT Snezn spectrum; Beryl, variety aquamarine (blue), Sneznoye deposit, eastern Siberia, plotted as 10 mm thick. Contributed data from M. Taran, Kyiv, Ukraine. MT A734 spectrum; Beryl, composition unknown, plotted as 10 mm thick. Contributed data from Michail Taran, Kyiv, Ukraine. MT 673 spectrum; Beryl, iron-rich, plotted as 10 mm thick. Contributed data from Michail Taran, Kyiv, Ukraine. MT 728 spectrum; Beryl, containing nickel, plotted as 10 mm thick Expanded region, 6K; Contributed data from Michail Taran, Kyiv, Ukraine. GRR 819 spectrum; pale blue bazzite from Naters, Switzerland. 0.137 mm thick. GRR 309 spectrum, 6K; Beryl (golden), Goias, Brazil, 3.306 m thick. GRR 795 spectrum, 6K; Beryl (golden), Zambia, 2.88 mm thick. MT yellow spectrum, 5K; Beryl, var. golden (golden yellow), Sneznoye deposit, eastern Siberia, plotted as 10 mm thick. Contributed data from Michail Taran, Kyiv, Ukraine. MT heated to blue spectrum, 5K; Beryl, var. aquamarine (blue), Sneznoye deposit, eastern Siberia, orignally yellow crystal heated at 400 C for 30 minutes to turn it blue. Plotted as 10 mm thick. Contributed data from Michail Taran, Kyiv, Ukraine. GRR 2536b spectrum; Beryl, variety pale pink, Mt. Antero, Colorado, 8.186 mm thick. This is a pink portion of the pale blue crystal described above from Mt. Antero. In addition to an iron feature near 830 nm, it shows a manganese feature near 560 nm. GRR 508 spectrum; Beryl, variety morganite, Brazil. 10.788 mm thick. MT Mn_4 spectrum; Pink beryl containing manganese, plotted as 10.0 mm thick. Contributed data from Michail Taran, Kyiv, Ukraine. MT A 724 spectrum; Pink beryl containing cobalt, plotted as 10.0 mm thick. Contributed data from Michail Taran, Kyiv, Ukraine.